When the first really bad storm of this winter hit Athens, I decided we needed something to really warm us up. So, for the two days we sat in the house while snow, freezing rain, ice, then snow again fell over our quiet little corner of Southeastern Ohio, I stirred up pot after pot of curry. This is one of the tastiest of the bunch, and once again, the original recipe came from Raghavan Iyer’s 660 Curries. I am beginning to worry that people will think I have turned into a Raghavan groupie, what with me presenting all of these recipes inspired by his book, but the thing is, if I get stumped on what to have for dinner, I just have to flip through, and within a few pages I always come across something that sounds appealing, and I usually even have the ingredients for it on hand. This curry is perfect for a blustery cold winter evening. It is especially good for dinner after a day of scraping ice from cars and shoveling snow from the driveway, because after all of that work, you need something hearty to warm you from the inside out. This is not a low fat dish, but it is a good one–and it is quite nourishing. The fenugreek greens are full of vitamins A and C, with a good bit of iron, the baby potatoes I added to the dish have lots of vitamins and fiber in them, and the yogurt is just plain old good for you. The onions, ginger and garlic have antibiotic properties, and the chilies have a lot of vitamin C in them. The cream–well–it is just there to tie everything together, I guess, in a rich, velvety sauce. I guess you could leave it out if you want to. You could add spinach to this dish if you wanted, or kale, but I liked it just fine with the methi greens alone. I added more of them to the dish than Iyer used, and instead of using just dried methi or frozen, as he called for, I used both. I like the concentrated flavor that comes from the dried greens, and the texture and color that comes from the frozen ones. I also added some dried, freshly ground spices to the dish–cumin, coriander, a bit of black cardamom and fenugreek seeds, and at the end, I added another dollop of yogurt, which I think improved the texture and color of the sauce. 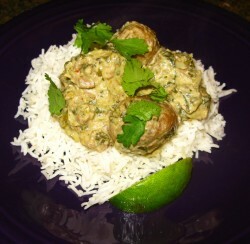 And I garnished it with fresh cilantro leaves and lime wedges, adding both flavor and color. This is perfect with steamed basmati rice and with sauteed broccoli with panch phoron. Put the first 10 ingredients into a spice grinder, food chopper or blender, and grind into a paste. Stir into the first measure of yogurt to make a thick, deliciously scented marinade. Toss the lamb with the yogurt mixture in a bowl and allow it to sit for at least twenty minutes. You can also cover it and put it in the fridge to marinate overnight if you want. Heat the ghee in a heavy-bottomed pot or pressure cooker. Add the sliced onion and cook, stirring, until the onion is deep reddish brown. Add the lamb, and cook, stirring, until it browns lightly. Add the frozen or fresh fenugreek greens and the dried, along with one cup of water. If using a pressure cooker, bring to a boil, clap the lid on it and bring to full pressure. Turn the heat down to low and cook for twelve minutes. If using a regular pot, bring to a boil, turn the heat down and simmer for twenty-five to thirty-five minutes or until the lamb is tender. If using a pressure cooker, release pressure and open cooker. Add potatoes. Turn heat up to high and bring back to a boil. Boil away excess water, until the sauce is quite thick and clinging to the meat. If using a regular pot, add potatoes and check and see how thick or thin the sauce is. If it is too thin, turn heat up to high, bring to a boil and cook off the excess water. If it is thick, add a bit of water and simmer to finish cooking potatoes. When potatoes are finished cooking, and the excessive water is boiled off, add the cream and the second measure of yogurt and stir to combine. Simmer for a couple of minutes to heat through, and then serve over plain steamed basmati rice, and garnish with generous handsful of cilantro leaves and some lime wedges. Note: If you wanted to make a vegetarian version of this, substitute pan-fried paneer cheese for the lamb. That is it. Paneer would taste FANTASTIC with this greens-laden sauce and the potatoes. In fact, I may have to make it that way next week so I can use up the rest of my paneer. I have bought “660 Curries” now, thanks to you, or else to Heidi at 101 Cookbooks. It’s a wonderful cookbook, though I’m not sure I’ve ever actually made a recipe from it just as it’s given. I usually like a technique from one recipe and the ingredients from another and end up combining them. Iyer’s book is by far my favorite Indian cookbook. His recipes always work, plus he is a riot to read! My current favorite is the Rajasthani cowpeas with roasted garbanzo bean flour. Yum!